Your Doctor's Wife: Look Kids! 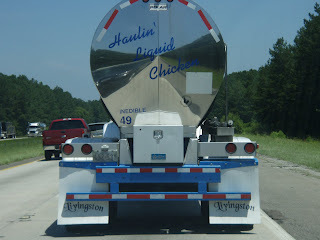 It's the "Liquid Chicken" Truck! From the age of 4 to 9, LB would only eat chicken nuggets, corn dogs, pizza, plain pasta and quesadillas. Any efforts to expand his dietary menu options were all in vain. This kid would eat nothing outside his "regulars". I'm not a complete stickler for organic, homemade meals, but I will admit that I do try my best to put healthy food on the table. I cook from scratch. I like to know what's going into my body. After having a few benign tumors removed from my body, I don't think I need any chemicals or additives in there messing with my healthy cells, you know what I mean? At his mother's house, LB would dine on frozen corn dogs, frozen chicken nuggets and frozen pizza bites. I'll never forget the day they came to the house and told me the absolutely love chicken cordon bleu. I thought "Wow! Their mom is a fancy cook! How am I going to compete with that?" (See...that's the step-mama in me talking.) Then they asked if I could buy some from the freezer section of the grocery store next time I'm shopping. Nope. Not gonna happen. I figure if I can't pronounce it, it's not going in my shopping cart. I hated watching LB and the girls chow down on chicken nuggets. It made my skin crawl. Was that really chicken? I couldn't tell. Kids: What? What is it? Me: Look at that truck! Read what it says. Kids: (after reading) EWWW...What's "liquid chicken"
Me: It's what they use to make chicken nuggets. I don't know if my last statement is true or not, but the words just flowed so effortlessly off my tongue and lips....sounded logical to me. I don't even really know what "liquid chicken" is, but I think all moms will agree "liquid chicken" sounds about as appetizing as a bowl of deep-fried cow patties. The minivan was filled with the sounds of disgust and disbelief of kids. I'm surprised none of them yacked right there and then. That was a dietary changing day in our family. If you're trying to wean your kids off the nuggets, I highly suggest you track this truck down. It seems to do the job. 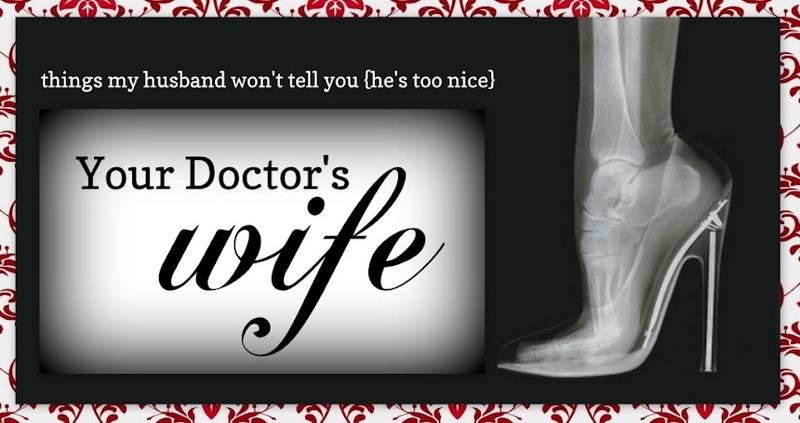 Please show the love and "Like" Your Doctor's Wife Blog on Facebook from your personal page. Thanks for reading! Lol! The secret to strong mothering is capitalizing on an oportunity when it comes knocking at your door, this was priceless! You are so right! This just worked perfectly! Now, I just have to make homemade nuggets, but at least we know what's in them! Now, I think so. Back then it just turned the stomach. BAHAHAHAHAHAHA! LOVE this! I have my own...issues...with chicken nuggets, but that truck seems to answer ALL questions concerning the topic! I wrote these before we "met..."
Life get in the way of all the fun stuff. Too funny! I need to see that truck and tell my kids that, maybe they wont want chicken nuggets. I don't know how many of those trucks are roaming the USA, but there should be more. It might help curb childhood obesity. I am not above lying to kids to get them to do or not do something. When eating something I didn't want to share, I told them, "you won't like." so they didn't eat or beg. When it came to the car and being quiet, I told them there were critters that ate loud children. so the sat still and slept on road trips. I told my youngest she was snatched from a very nice woman at Kmart. My very own Blue Light Special. What purpose did that serve? I don't know. But it was fun and she believed that until she was 14. I live near a chicken processing plant, so I know what liquid chicken is and believe me you don't want to. To make chicken nuggets you cut chicken breast into nuggets, dredge them in egg and a mixture of flower, salt, pepper and garlic. Deep fry them until they turn crispy brown. But, really....what is liquid chicken?? That is completely disgusting and you're probably right. I watched the documentary Food Inc. That was a wake-up call. No more McDonalds or Tyson chicken for us! We try to eat as organic as possible now that we have a child. Trying to set good guidelines but it's still hard not to indulge in fast food every once in a while. I bet it's full of the mechanically separated chicken. If you have not seen that stuff getting made before, just check out YouTube. Please tell me that's not for real! My mouth is watering and I'm fighting vomitting all over my keyboard! Oh, no...it's real! True story. I still am not sure what liquid chicken is though, but I'm sure it's barf worthy. Ewww. I clearly remember the year I realized that not all food was created equal, that some meals were only food in a very technical, chemical sense. AS gross as it is, at least you let the kids in on the secret! Hilarious. Way to take advantage of serendipity. Love the blog. Have a Great SITS Day. Ha! This was awesome. Looking in the phone book for "liquid chicken" truck drivers now. I want to see if they'll ride past my house. lol. Stopping by from SITS. Happy SITS day girl! Have fun! Oh that is so gross! I make my own chicken nuggets, and they aren't liquid. Happy SITS Day!! OMG, I LOVE this post! I also cook mostly from scratch, don't buy frozen or canned food, and try to keep a healthy diet in my home. Hmm... I really wonder now about "liquid chicken". GROSS! Stopping by from SITS... happy SITS day! This post is as gross as it is hilarious! Happy SITS day! I stopped buying prepared food after reading the salt content, but this just sealed the deal. Liquid chicken? I don't want to know. Stopping by from SITS, happy SITS day! I so need that truck in my life. Not because I want what's in it, but because I have a nasty nugget lover too...and it drives me crazy! Happy SITS Day! One more reason why I'm this close to becoming a vegetarian! Ha! I love those kind of moments. As a homeschooler I get to direct them fairly often. Happy SITS day! That is a sure way to get your kids off that "stuff", I myself cannot eat anything that I cannot identify...good for you and sticking to your guns in wanting to serve them healthy good! Love it!!! What a brilliant thing to say! I can just imagine how those chicken nuggets kind of disappeared from the kitche after that! Stopping by from Sits, by the way!